ALLEGRA BOVERMAN/Staff photo. Gloucester Daily Times. Gloucester: Harborwalk is being built. The groundbreaking was held Friday at St. Peter's Square. 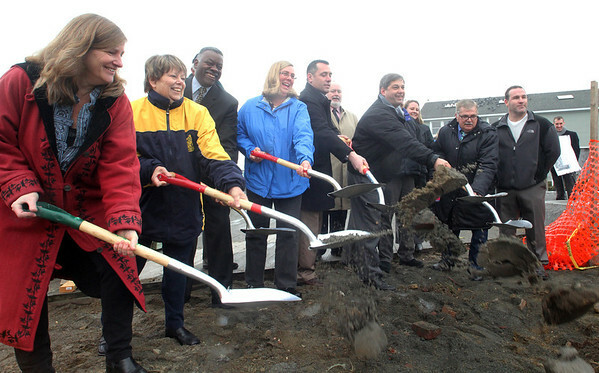 From left are: Community Development Director Sarah Garcia, City Council President Jackie Hardy, Lous Elisa, executive secretary and director of port development, Gloucester Mayor Carolyn Kirk, Public Works Director Mike Hale, Sen. Bruce Tarr, Bob Whynott an Steve LeBlanc. Behind them are Paul McGeary and Melissa Cox, and at far right, background, project architect Chris Musckopf, project architect from Cambridge Seven Associates, Inc.